This was our first workshop on the Melbournian grounds. 34 participants joined the workshop, including 10 ECR and PhD students who received CBRI funding. What did you like about that workshop? A debrief session each morning with Sebastien running the show. With the advent of high-throughput sequencing technologies, multivariate dimension reduction methods propose powerful statistical analyses to obtain a first understanding of large and complex data sets. They provide insightful visualisations, are efficient on large data sets and make little assumptions about the distribution of the data. In addition, they are highly flexible as unsupervised (exploratory) or supervised (classification) analyses can be performed. The latest innovative developments in this exciting and fast-moving area of research include and integration of different types of data sets and variable selection. 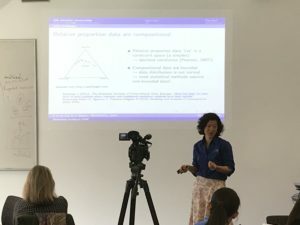 This hands-on course will introduce key concepts in multivariate dimension reduction, starting first with Principal Component Analysis, then with innovative approaches for statistical integration of multiple data sets with a particular focus on variable selection. Nineteen methods are currently available in the mixOmics package, amongst which thirteen are developed by the mixOmics team. Each methodology introduced in the workshop will be illustrated on real biological studies directly available from the package. Fees for 3 days are AUD450 for RHD students, AUD600 for UoM or affiliates based on the Parkville campus, AUD900 for external non-profit organisations and AUD1200 for industry / government. 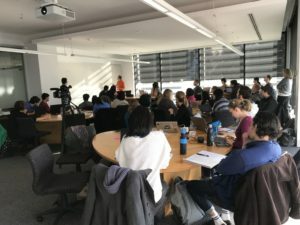 The Computational Biology Research Initiative (University of Melbourne) proudly sponsors registration bursaries (50% of the registration costs) to 5 RHD students enrolled at UoM and 5 ECR (<= 3 years post PhD, full time equivalent) UoM or affiliate based on the Parkville campus, indicate your eligilibity at the survey link below. 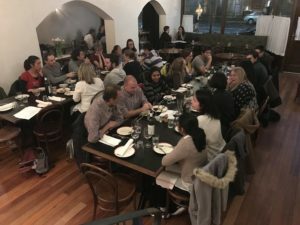 Registrations fees include coffee breaks, lunch and one ice-breaker dinner (Monday 23 July evening), lecture notes and electronic material (slides, R code, data). Registration A link for registration has been sent to all selected participants. Priority was given to postgraduate students and early career researchers, with a maximum of 30 participants.